The growth of what some academics refer to as 'the policy analysis movement' represents an effort to reform certain aspects of government behaviour. The policy analysis movement is the result of efforts made by actors inside and outside formal political decision-making processes to improve policy outcomes by applying systematic evaluative rationality to the development and implementation of policy options. 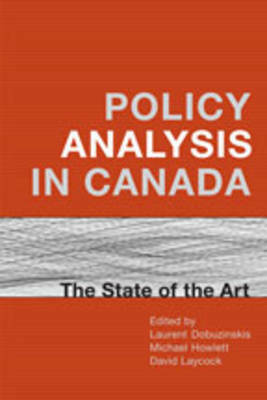 This volume offers a comprehensive overview of the many ways in which the policy analysis movement has been conducted, and to what effect, in Canadian governments and, for the first time, in business associations, labour unions, universities, and other non-governmental organizations. Editors Laurent Dobuzinskis, Michael Howlett, and David Laycock have brought together a wide range of contributors to address questions such as: What do policy analysts do? What techniques and approaches do they use? What is their influence on policy-making in Canada? Is there a policy analysis deficit? What norms and values guide the work done by policy analysts working in different institutional settings? Contributors focus on the sociology of policy analysis, demonstrating how analysts working in different organizations tend to have different interests and to utilize different techniques. They compare and analyze the significance of these different styles and approaches, and speculate about their impact on the policy process.